What Is the Difference Between Rye Bread & Pumpernickel Bread? 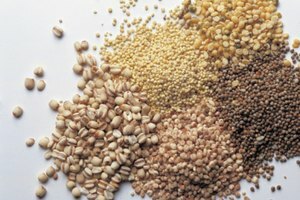 If you're interested in food and nutrition, you probably already know that carbohydrates have gotten a bad reputation over the past several years. Cutting out unnecessary sugars and refined starches is certainly not a bad thing, but there are plenty of ways to do that and still enjoy healthy carbs. A lot of those come in the form of whole grains, so a simple switch – going from white to brown rice, for example, or from white bread to whole-grain bread – turns a dubious choice into a healthy one. Whole wheat bread is the most common choice, but pumpernickel and other rye breads can be a tasty alternative. If you're unclear about the difference, all pumpernickel is rye bread, but not all rye bread is pumpernickel. Rye is grown a lot in the colder and wetter parts of Europe, wherever wheat is a high-risk crop. You'll see it in the Scandinavian countries and in central and eastern Europe, which is why those countries have a strong rye bread tradition. The problem with rye is that, compared to wheat, it makes a really dense loaf. Its has plenty of gluten, but rye gluten isn't as strong as the kind that makes wheat bread so light and fluffy. All-rye bread can be really sticky as well, unless the dough is made and handled with real skill. The bottom line is that almost all the rye bread you see in bakeries and supermarkets is made from a mixture of rye and wheat flour. A real, traditional pumpernickel loaf is one of the exceptions to that rule. It's made from coarsely ground dark rye flour, larger pieces of cracked rye and a sourdough starter. It's not a quick bread to make, because the cracked rye needs to soak overnight to soften it up, and the starter needs a day's head start so it can ferment properly and release the rye's natural flavor and sweetness. Then, once the bread is mixed, it's baked overnight for 12 to 14 hours at a low temperature, about 250 degrees Fahrenheit. 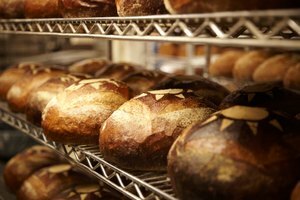 That long, slow baking time caramelizes the natural sugars in the bread, giving it a distinctively dark brown color. The finished loaf is very dense and heavy, with deep and complex flavors, and makes fragile slices that crumble if they're handled roughly. Conventional rye bread takes a much more conventional approach. 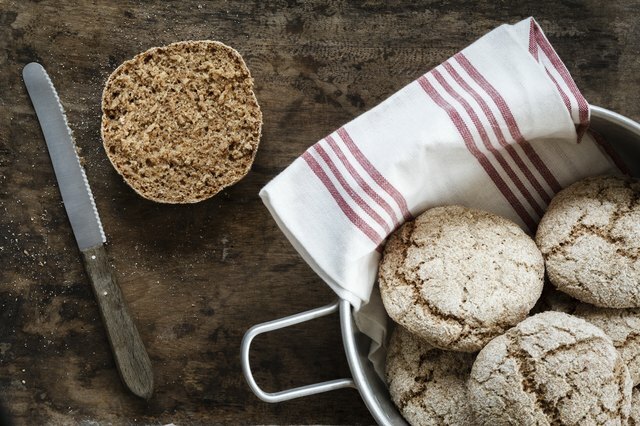 It's made from a mixture of wheat flour, for the gluten, and then varying amounts of light or dark rye flour. The rye flour gives it the distinctive rye taste, while the wheat flour makes the dough easier to handle and the finished bread lighter and fluffier. It can be mixed and baked in a few hours, like wheat bread, though an artisan bakery might use a slow, overnight rise or a sourdough starter to give it more flavor. If you're looking for whole grains, you want more dark rye flour than light. Check the label to be sure it's dark because of the flour itself, not just from added caramel color or molasses. If you think the pumpernickel bread you buy at the supermarket sounds more like conventional rye bread than old-school, old-country pumpernickel, you'd be right. That extra-long preparation and baking time make it a high-cost bread to turn out in a production bakery, so it's much more economical to take a regular loaf of rye and tweak it. Most recipes use things like molasses, coffee and caramel color to fake the flavor and color of pumpernickel, and add some coarse rye for texture. It's not bad bread, it's just not the same. You can find good recipes online for both the quick-and-dirty version and the traditional version, so baking each makes for a pretty interesting "compare and contrast." Can You Re-Bake Undercooked Bread?